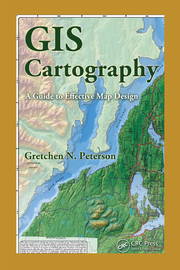 I just finished reading a new book by Gretchen Peterson called GIS Cartography: A Guide to Effective Map Design and I really enjoyed it. Gretchen wrote this book independent of any GIS tools so that you can apply it anywhere, from ESRI and Autodesk to PowerPoint and Web Mapping. So much of computer books include sections on preferences, installation and best practices, that it takes away from actually learning key concepts. Cartography is critical to visualization of spatial data and with so many different ways to visualize that information these days, you need these key concepts to ensure that you are getting your message out. Gretchen’s writing style was enjoyable and she was able to cover detailed concepts without losing my interest. I’m guessing because we come from similar GIS backgrounds, I really was able to follow her though process and better understand how I should look at GIS cartography. Another think I really liked was the ability pick the book up and find a section to review so I can see this being a great reference book as well. The chapter on fonts was particularly enjoyable. So often I believe this is an area overlooked by GIS cartographers and can greatly affect the ability of readers to understand your maps. Color is another area that Gretchen covers and in great detail. The world is much more complicated than just polygons so she goes much deeper than most websites and GIS books have into how color affects your output. GIS books aren’t cheap because they never do the volumes that general computing books do, but when you can apply them across multiple software packages and disciplines, you get much more value out of them. Gretchen’s book is something that you can use almost anywhere with any medium and won’t get out of date. That is a great value that most technical computing books overlook. GIS Cartography is a great resource to have and one that I’m glad that I have in my technical library. I’m guessing though that it will spend more time next to my computer than on the bookshelf. Flip through the pages at Google Books and see how valuable this book is. Great job Gretchen!